The work of Gerd Arntz (1900-1988) is of great importance to the world of visual communication. His signs are drawn with preciseness and a wonderful feeling for dimensions. 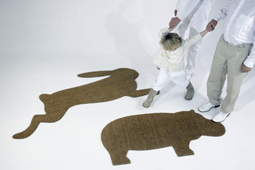 Ed Annink, Ontwerpwerk, repositioned two of them and made them available in the consumer market as doormats. Doing so the legacy of Arntz became visible for a wider audience.